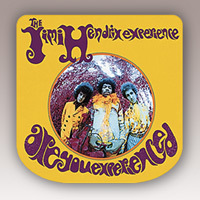 The design on this Jimi Hendrix sticker is from the Are You Experienced? album cover. This sticker measures approximately 4" square. Put it on your car, locker, tool box, wall, laptop, etc. Officially licensed Jimi Hendrix merchandise.